Diabetes : Diabetes Rates Leveling Off in U.S.
TUESDAY, Sept. 23, 2014 (HealthDay News) -- Overall adult diabetes rates appear to have leveled off during the past four years in the United States, in stark contrast to the two decades prior, which saw a doubling of the chronic disease, according to a new federal study. 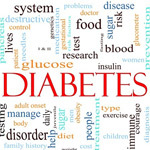 The total number of people living with diabetes increased an average 0.6 percent annually between 2008 and 2012 while the number of new cases actually fell an average 5.4 percent, researchers for the U.S. Centers for Disease Control and Prevention (CDC) reported. That compared with an average 4.5 percent annual increase between 1990 and 2008, they said. Not all groups in the United States have benefited, however. Diabetes rates continue to rise for blacks, Hispanics, the aging and the poorly educated, according to the report published in the Sept. 24 Journal of the American Medical Association. "We are beginning to see a slowing of the increase in diabetes, and potentially a plateauing," said study co-author Ann Albright, director of the CDC's Division of Diabetes Translation. "It should give us all some optimism, but it does mean we should not sit on our laurels." Success in tackling the United States' diabetes epidemic likely plays a large role in the leveling off of rates, Albright said. "Obesity, of course, is a major risk factor for type 2 diabetes, which is the predominant form of the disease," she added. The researchers noted that the growth of diabetes and obesity rates have both slowed as declines have taken place in people's overall calorie intake and food purchases. For the study, CDC researchers analyzed data for nearly 665,000 adults between 20 and 79 years old. The data was taken from the National Health Interview Survey, an annual survey used to monitor illness and track progress toward health goals in the United States. In a 20-year period, they found, the total number of diabetes cases doubled: from 35 per 1,000 people in 1990 to 79 per 1,000 in 2008. The annual number of new diabetes cases more than doubled in that time frame: from 3.2 per 1,000 people in 1990 to 8.8 per 1,000 in 2008. But something changed between 2008 and 2012. The total number of diabetes cases increased only slightly, to 83 per 1,000 people in 2012, while the number of new cases declined annually, to 7.1 per 1,000 in 2012. The fact that the total number of people with diabetes has risen slightly is not necessarily a bad thing, said Dr. Robert Ratner, chief scientific and medical officer for the American Diabetes Association. It shows that "we've had an impact on death rates," he explained. "People with diabetes are living longer and living healthier." Albright added that the decrease in new cases is a very positive development. "Hopefully, we will begin seeing fewer people with diabetes because we are seeing fewer new cases of diabetes," she said. "But even with the slowing, we're still going to have lots of people with diabetes. This is telling us that some of the things we've been doing have been helping the situation, but we are going to have to monitor this carefully -- and we can't get lax because we have a long way to go." The CDC, in particular, has made inroads with its National Diabetes Prevention Program, an evidence-based lifestyle change program that can cut a person's risk of type 2 diabetes in half through diet and exercise. However, the continued increase in diabetes rates among blacks, Hispanics and people without a high school education reflects the difficulty in making these sorts of programs available to people at a lower social or economic level, Albright said. "You have to begin to look at things like poverty level, access to these kinds of diabetes prevention services, making sure that these services are culturally appropriate and easy for people to access," she said. And even with the plateau observed by the CDC, diabetes will remain a costly public health crisis for years to come, Ratner noted. "Keep in mind, in 2012, we spend $245 billion on diabetes and its complications," he said. "Unless we do something to really stop the development of diabetes, we're going to end up spending even more money, and diabetes is going to bankrupt us."